Have you ever felt embrassed for your bloated front pocket with big bulky wallet? Now, you deserve this great front pocket wallet ----the key to start your minimalist life! A tag can be read from up to several feet away and does not need to be within direct line-of-sight of the reader to be tracked. Modern thieves are using RFID readers to steal your personal information on your credit, debit and ID cards. This Wallet is designed to protect your cards from these RFID readers. ◤2018 New Version Minimalist Wallet: Our superior ultra-modern design is extremely strong and impressively minimal conveniently allowing EDC of your credit cards, cash and ID. This compact 100% GENUINE carbon fiber cardholder will fit comfortably in any pant, trouser or shirt pocket and was built to last. Reduce the bulk while still carrying up to 12 cards effortlessly! 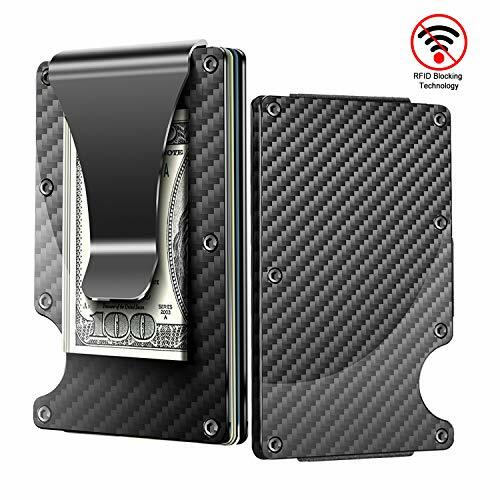 ◤Slim & Ultra Light: Carbon Fiber Wallet, Metal Money Clip Wallet, RFID Blocking Minimalist Wallet for Men INNKER Black Aluminum Slim Cash Credit Card Holder for Front Back Pants Pocket Carry,slim yet expandable build, you can enjoy a durable wallet with good touch and stylish simplicity. ◤RFID Blocking Technology: keep yourself safe from thieves' scanning devices. Stop walking around in fear that your private, personal information is being stolen. Get protected NOW with our Prestige men's wallet equipped with RFID BLOCKING Technology. Designed and TESTED to block 13.56 MHz frequencies (debit & credit cards, passports etc.) Does NOT block 125 KHz frequencies (security access cards, hotel room keys, etc.). Don't wait, until it's too late!US GOVT. FIPS 201 APPROVED. ◤Gift Box Packaging: Our Carbon Fiber Wallet are the number 1 choice because they are premium quality, efficient and functional providing extreme longevity and style for everyday life & travel. Elegantly Packaged in a beautiful black designer gift box making it a great gift for your husband, boyfriend, brother, boss and unique gifts for men who have everything. If you have any questions about this product by Halowin, contact us by completing and submitting the form below. If you are looking for a specif part number, please include it with your message.